Growing raspberries in high tunnels can extend the growing season by several weeks, increasing yields and profits (and labor requirements) and enabling growers to raise varieties that aren’t winter hardy otherwise. Photo courtesy of Pennsylvania grower Wayne Breisch. Handley spoke at the November 2004 Farmer to Farmer Conference in Bar Harbor, cosponsored by MOFGA and Cooperative Extension, as did Kathleen Demchak of Pennsylvania State University and Jean Hay Bright and David Bright of BrightBerry Farm in Dixmont. Drainage can be improved by adding organic matter, installing tile drainage, and growing on raised beds, where raspberries do well because “the bulk of the root system is in the top 8 or 10 inches; but you have to make sure you have adequate irrigation, and they may be more susceptible to winter injury.” Maintain a soil pH of about 6.0; raspberries tolerate a range of soil acidity. In exposed sites, establish windbreaks before or at planting. “In Europe and New Zealand, some of these horticultural meccas, they don’t grow any kind of bramble or bush crop planting over an acre without a windbreak,” Handley noted. Wind shortens plants and can reduce yields and increase winter injury. A gentle slope (8% maximum) and good elevation are desirable. Run rows against the slope, and don’t set plants at the top of the hill, where wind can be damaging, or at the bottom, where water and frost can settle. Eliminate wild brambles within 500 feet of your planting – or whatever distance is practical – since viruses, endemic in Maine’s native brambles, are carried by aphids and leafhoppers. Windbreaks help with disease control, too, since aphids are weak flyers. Raspberries have a biennial growth habit. The above-ground part of the plant, the canes, emerge from buds on root suckers in the spring. The first, “primocane” year of growth is vegetative and has green “bark” or epidermis. Primocanes form flower buds in their leaf axils in the fall in response to short days. These buds stay dormant through winter. Second-year canes that came through winter, “floricanes,” have brown “bark.” Buds that set the previous year now break and produce little branches called fruiting laterals, and flower buds on these produce fruit. The floricane dies after fruiting, and new primocanes that will produce the following year’s crop arise during the summer. Everbearing, or primocane fruiting raspberries are different. Their primocanes form buds in the leaf axils and at the cane tips. The tip buds break and produce some fruiting laterals and a small crop in the fall. Buds lower on the cane stay dormant over winter, then break the following year for a summer crop, just like summer-bearing varieties. These canes die after fruit production. Only a handful of raspberries are winter hardy in our region. “‘Boyne’ and ‘Killarney’ are probably the hardiest.” They are reasonably early and have relatively short, stocky canes with lots of very fine thorns that aren’t bothersome. ‘Boyne’ fruit is small to medium and tends to be a little soft. This is the variety to grow in northern Maine; others are possible in southern Maine. ‘Encore’ ripens very late; and is a good bridge between late summer bearing and everbearing types. The fruit is large and of very good quality. Canes of ‘Encore’ came through the winter of 2003-2004 fairly well. K81-6 is a good midseason variety with good fruit size, but it will have difficulty in a really hard winter. ‘Killarney’ fruits are a little bigger and brighter colored than those of ‘Boyne’ but ripen a few days later. Both are early to mid-season types. ‘Lauren’ is only for the most protected spots or for very southern Maine. The fruit is very large and of pretty good quality, and plants are productive. ‘Taylor’ is “the row to have next to the house for yourself. It’s probably the best tasting raspberry out there.” Plants are reasonably tall and not too thorny. Fruits are not the largest but have excellent quality. Winter hardiness can be a little questionable, and it’s very susceptible to diseases, but customers will like it. ‘August Red,’ probably the earliest maturing of the bunch, starts the first or second week of August. The fruit quality is OK, but plants are “small, wimpy and ugly” and not fun to work with. If you’re in a real early frost area and you want the late market, this is probably your best bet. ‘Autumn Bliss’ is about 10 days earlier than ‘Heritage’ and tends to overwinter better than ‘Autumn Britten.’ Winter hardiness “may not be an issue if you mow them and just use them for a fall crop” (discussed later). ‘Fall Red’ is about two weeks earlier than ‘Heritage.’ Fruits are small and of reasonable quality. Plants are very vigorous, considering the amount of fruit, and will try to take over. It’s vary hardy if you want to grow it for a summer crop. Set plants at the same depth as they were in the nursery, generally in a trench about 10 inches deep. Spread the roots so that they’re not balled up; plants should have a good 10 inches of root growth. Space plants 20 to 30 inches apart in the row. “If you know you’ve got a variety that’s very aggressive, such as ‘Fall Red,’ you can plant them farther apart [2 to 3 feet], and you’ll have plenty of suckers coming up to fill out the row. If the variety is a shy sucker producer, like ‘Autumn Bliss,’ then you may want to buy more plants and put them closer … [otherwise] they’ll take longer to fill out the row. You can grow annual crops, such as lettuce and cucumbers, using about 6 feet of space between rows during the first couple of years. “But you really need that space, because once these canes start growing and arching over … it’s very difficult to get between them, unless you’ve left that space.” If you can’t get between rows to work, suckers fill the row middle, creating a solid block “that I call the dreaded raspberry patch.” Customers can reach in only from the edges. Fruit is wasted, and eventually plants die from disease or crowding. Once planted, handles are cut to about 4 to 6 inches above ground, leaving just enough to mark the plants, in order to promote root and sucker growth rather than fruiting in the planting year so that the row fills. “Plus there won’t be enough fruit on there to make it worth your while to get the labor out there to pick it,” Handley noted. Keep the planting clean cultivated (except for a potential annual crop between rows). You can apply a straw mulch in the planting year to keep annual weeds from re-emerging. Data suggest that this will increase growth, but “don’t leave straw mulch on in the second year,” Handley warned, because “the cool, moist environment promotes root rot.” He advised removing mulch early in the spring of the second year. Trickle irrigation should be set up in the planting year to encourage root development and primocane growth. Trickle is better than overhead irrigation, which wets the foliage and invites diseases. Maintain a 1.5-foot row width to ensure that canes in the middle won’t be shaded and lose fruit buds, and for good air movement. When suckers emerge beyond that width, run a cultivator or hoe through. In the second spring, you can establish a ground cover, such as a weak perennial grass, between the rows, “but you want a good 3- to 4-foot section with nothing growing on it but raspberries,” Handley notes. A bluegrass-fescue mix works well, but don’t use a conservation or contractor’s mix; these contain aggressive grasses. Avoid clover, too, because it will crawl into mulched areas. “Although it supplies some nitrogen, it’s better to get nitrogen from other sources.” You could include annual rye for a flush of green while the fescue slowly takes over. Handley likes a mix that grows so slowly that it has to be mowed only a few times a year. A T-trellis is most common in Maine. Illustration from “Growing Raspberries and Blackberries in Maine,” by David T. Handley, University of Maine Cooperative Extension. Set up your trellis system in the first, second or third year. Putting this job off can save money in the first year or two. A T-trellis — the most popular system in New England — holds plants so that harvest and other jobs are easier, and it prevents plants from flopping over when loaded with fruit. Put posts every 25 to 30 feet, with at least 2 feet below ground and 4 to 5 above, and anchor both ends of the row or support them with internal braces. Cross arms on each post should be 31/2 to 4 feet high (depending on variety) and about 31/2 feet wide. On each side of the cross arms, attach a wire, such as wire used for electric fencing. After pruning, attach canes to the wires with twine, rubber bands or tomato clips. These canes will fruit the following spring. When you stand at the end of a row, you should see a V, with plants spreading from the 11/2-foot row out to the width of the 31/2-foot-wide trellis at a height of about 31/2 feet. This spreading allows light into the center of the row for the emerging canes, and it keeps canes dry. If you maintained the 11/2-foot center row upright, new canes would come up outside of that row, where the light is, and to harvest, you’d have to fight through the thorny new canes. By spreading fruiting canes to the outside of the row, any new canes that come up outside of that row can simply be whacked off. A V-trellis is stronger than a T-trellis but requires twice as many posts. Illustration from “Growing Raspberries and Blackberries in Maine,” by David T. Handley, University of Maine Cooperative Extension. A V-trellis is another option. Sink two posts at a 20- to 30-degree angle every 25 to 30 feet, 2 feet deep, anchoring the end posts, and run a couple of wires on them. Attach floricanes to the wires. This system requires twice as many posts as the T-trellis, so it costs more but is sturdier and lasts longer; cross arms tend to be the weak point of a T-trellis. A planting takes three or four years to reach full production and lasts 10 or 15 years, average – or only five to eight on heavy soils. Handley has seen 25-year-old plantings that are still going strong, due to good management and excellent soils and sites. Summer thinning involves weed-whacking new canes outside of the 11/2-foot row two to three times. Weak, infested canes should also be removed. Wait until late winter or the following spring to remove spent floricanes, since these send carbohydrates to the root system as they die back. These have gray, peeling bark and old fruiting laterals; remove new, healthy floricanes that are outside the 11/2-foot row (these were green last year and have now hardened, with chocolate-brown bark, and have few or no fruiting laterals); remove weak or unhealthy canes; then thin the planting, leaving the tallest, thickest canes for a final density of three to four canes per linear foot of row, average. “They won’t be evenly spaced, because raspberries grow in clumps.” Compost, burn or take prunings to the transfer station to remove disease sources. A simpler way to prune is to mow the entire planting. “If you mow off a regular planting of, say, ‘Boyne’ in the spring,” Handley explained, “you won’t get a crop that year; canes will come up, form buds and overwinter, then the following year, you’ll get a crop. If you could put up with a crop every other year, you could save having to prune.” Or, if you want a crop every year, you could mow one row one year and an alternate row the next. If you mow an everbearing variety in the spring, you’ll get a fall crop on the primocanes but you won’t get a floricane summer crop. You can mow these every year and grow another, summer variety with better fruit for the summer crop. “This is the way everbearers are generally handled … don’t start mowing until they’ve been in the ground for three years to get well established,” since mowing removes some plants nutrients. Cool berries immediately. Fans can move plenty of air; be sure to stack boxes so that air can circulate between layers. Establishing a raspberry planting will cost $3,000 to $5,000 per acre for good soil preparation, plants, trellises and labor. Maintenance beyond year 4, when plants are in full production, will cost $6,000 to $7,000. The net return runs from $0 (after a winter like 2003-2004, when you may not pick any fruit) to $6,000 per acre, which is better than strawberries. Yields range from 0 to 6,000 pounds/acre; that maximum is “doable” in Maine, but typical yields are 4,000 to 5,000 pounds. You should be able to get $1.50 to $3.50 per pound. At the Farmer to Farmer Conference, Jean Hay Bright (left) talked about the raspberry planting that she and David Bright have established in Dixmont, Maine; and Kathleen Demchak from Penn. State U. addressed the potentially high yields of raspberries grown in high tunnels. English photo. Kathy Demchak and coworkers at Penn State have been researching raspberry cultivation in high tunnels for five years. “High tunnels,” explained Demchak, “are unheated greenhouses.” The sides roll up, and at Penn State, end pieces flip up and side wings fold out so that a tractor can get into the house. Their houses have peaked roofs to shed snow. Demchak noted that central Pennsylvania has had so much summer rain in the last couple of years that growers with raspberries under tunnels were the only ones to make money. She and her coworkers are also studying strawberry and hardy kiwi cultivation in tunnels. ‘Heritage,’ for example, starts ripening around Labor Day in central Pennsylvania and really gets producing around the third week of September; and the first frost usually hits in the first week of October. Also, thornless blackberries are frozen out every winter, so tunnels may enable production of that fruit. No fungicides were required, and “five years later we still haven’t needed any — which was a shock to us, because grey mold typically is the problem in field production;” and almost no insecticides were used. Predatory mites were used to control two-spotted spider mites, and Neemix was used on Japanese beetles one year, but didn’t seem to help much. Organic fertilizers were applied based on tissue testing. Some grey mold appeared in 2003, a wet year, but no fungicides were used. The 2004 crop was still being harvested in November, so data weren’t available. A similar field planting established outdoors for comparison didn’t produce any decent fruit. Again, plants in these tunnels had very little grey mold or other diseases. In 2000 and 2001, two-spotted spider mites occurred in both experiments. “You change problems from what you typically see in field production to what you typically see in greenhouse production,” Demchak explained. In 2002, Japanese beetles were on the summer crop but were gone when fall berries came on. In 2003 and 2004, some leafhoppers and whiteflies were present, possibly because other crops in nearby tunnels had attracted them. Plant nutrition is of potential concern. “You’re producing a tremendous amount of foliage and fruit. We’re doing leaf analysis every year to guide our nutrition program.” Using compost for fertility may produce a salinity problem at some point, Demchak added, because the houses are relatively dry and salts aren’t flushed out by rains. Estimating “a little on the low end,” Demchak projected 15,000 lbs./A total (summer and fall) yields. “You’re getting a lot of crop, but you’re also harvesting for a longer time than with field production.” Fruit size is about 50% greater; quality is improved; and berries stored up to 11 days “and still looked good.” Pesticide use was decreased markedly or eliminated. A 21-foot tunnel (rather than the experimenters’ 17-footer) with three rows spaced about 7 feet apart and plants 18 to 24 inches apart is probably ideal. Both summer and fall-cropping is feasible for primocane-bearing raspberries because of the longer harvest season. Trickle irrigation is necessary. ‘Autumn Britten’ is still Demchak’s favorite. ‘Caroline’ fruits were a little smaller. 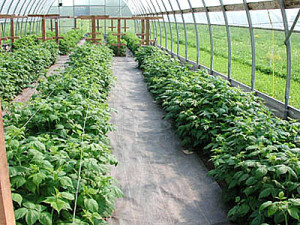 A high tunnel costs about $5,000 for supports, plastic, labor, etc. Other costs (trellis, fertilizer, trickle irrigation, etc.) are the same as for field production, although you may pay a little more for plants, because they’re spaced closer than in fields. The big cost is harvest labor, estimated at $0.50 per half-pint. With yields of 0.75 lbs./ft. of row in year 1, and 2.1 lbs./ft. of row in years 2 through 8, and receiving $2.50 per half pint, the profit is $942 per 17 x 96 tunnel, or $20,357 per acre. Demchak thought that the amount of work involved may preclude growers from keeping the planting beyond eight years, although that may be possible. Demchak noted that pollination is not a problem since the sides of the tunnel are open when flowers are being pollinated, even in October, for flowers that produce November’s berries. Jean Hay Bright and David Bright of BrightBerry Farm talked about their raspberry planting and plans. Jean started selling raspberries from her grandmother’s patch in Youngstown, Ohio, when she was 8 years old, for 35 cents a quart. Now she and David live on a sloping farm in Dixmont, Maine, that they bought in 1999 and have been developing since. They plan to have 3 acres of raspberries, 1 of blueberries and 1 of annual crops in rotation. They’ve planted ‘Boyne’ and ‘Killarney’ for early-season raspberries, ‘Nova’ for midseason, ‘Taylor’ for late and ‘Polana’ and ‘Autumn Britten’ for fall bearing. They also planted ‘Jewel’ black raspberry, which overwintered and produced berries in 2004. Plants are oriented on the contour of their slope for best exposure to sun, for erosion control and for level drip irrigation lines. Also, pickers won’t have to walk up and down hills to harvest an individual row. (They anticipate selling half of their planting as PYO and half retail or wholesale.) Plants are spaced 18 to 24 inches apart within rows, with rows 10 feet apart on center. He put a stake at the highest corner of his contour, then used a $10 “pop level” to find the contour and lay the first 100-foot section of drip line. “From there, make your 10-foot rows.” They use 15-mil T-tape, which will last for more than one season. If you use rigid plastic pipe for part of your irrigation, David said to bury it, “because you can’t maneuver around it. We’re moving toward having a lot of stuff underground.” Sunken boxes, their tops flush with the ground, can cover permanent pipes so that you can remove the top of the box and reach in to turn a valve. The Brights are “draining their hillsides” into two ponds at the bottom, and they pump water from these into two 5,000-gallon tanks at the top of the hill, using gravity to feed water back down the hill through drip irrigation. Each of their water pumps has a filter, as does each header line. A pressure regulator keeps the water pressure at the required 8 to 12 psi, and pressure gauges signal potential problems. David puts a hose fitting at the end of each drip line, opens it when he starts to irrigate to flush the line, then shuts it. The end of each row of tape is held down with ground staples, like those used on fabric row covers. “It’s amazing where the deer will take [the drip line] otherwise” before rows fill in. Flags (from Forestry Supply) signal places where they have ground staples and other parts of their irrigation system, and cardboard placed under various components keeps the grass down and enables them to find those parts. David priced irrigation supplies for an acre at $527, or about $50 per year over 10 years. This does not include costs of the water supply or pipe and fittings to deliver water to the site. For a trellis, Jean simply pounds 4-foot hardwood stakes into the ground every 10 to 15 feet along each side of the row, across from each other, and wraps baling twine around the top of each stake for the length of the row. “You don’t need a post hole digger, and it works beautifully.” You can tie twine across two opposite stakes if the plants have vigorous growth. The string is about waist-high and lasts for a year. Cane tips that are wilting due to borers are removed and put in black plastic bags as soon as Jean sees them. Rows are kept weeded for good air flow and light penetration, and in case customers are allergic to flowering plants. Removing weeds also minimizes the number of stinging insects that customers are exposed to, and helps customers see the berries. Jean flags places where birds or wasps are nesting, and warns customers to stay away from them. Jean said that they do pick into some pint containers and have sold berries in pints and half pints. They do not let customers pick into their own quart containers, but provide new, green pint boxes as part of the PYO price. They freeze 120 pounds to sell to Common Ground Fair vendors, putting the berries on trays and into a Sears Quick Freeze cooler, then putting them in 20-ounce Ziplock bags. Having other fresh produce available helps attract customers to their farm, and Jean and David hope to add other products, such as ice cream or smoothies, pies or other deserts. They suggest thinking about traffic flow when designing your farm, including room for parking and for turning tour buses. Customers should have drinking water, restrooms or privies, and hand-washing stations available. Jean gets men’s shirts from used clothing stores and lends them to people who aren’t dressed appropriately for picking. A. M. Leonard, Inc., 241 Fox Dr., Piqua, OH 45356; www.amleo.com. Demchak, Kathleen, Jayson Harper and George Greaser, 2001, “Agricultural Alternatives – Red Raspberry Production,” Penn. State University Cooperative Extension, http://agalternatives.aers.psu.edu, Publications Distribution Ctr., The Penn. State Univ., 112 Agricultural Administration Bldg., University Park, PA 16802; 814-865-6713; kdemchak@psu.edu. Kelco Industries, P.O. Box 160, Milbridge ME 04658; 800-343-4057; www.kelcomaine.com. Pritts, M. and D. Handley, eds., 2005, Bramble Production Guide. Northeast Regional Agricultural Engineering Service, $45.00 plus $6 s & h from NRAES, Cooperative Extension, P.O. Box 4557, Ithaca, NY 14852-4557; 607-255-7654; nraes@cornell.edu; www.nraes.org.